An innovative free standing folding professional goal post that is light and easy to move around. This is a heavier goalpost than other lighter versions and requires extra care in use. This freestanding goalpost crossbar conforms to the strength test required on BS 8462:2005+A2:2012. With sides that lock in play and in storage this patented system enables accountability and prevents unauthorised use of the goal posts. It is much easier and lighter to carry than football goals with heavy steel folding sides that swing about uncontrollably. Unlike all the other hinged sided goals these folding goals also fold flat (flush); this enables multiple sets to be stored flat next to each other saving on storage space. They have fully welded lightweight yet strong aluminum side frames with no steel at all making them totally rust free. Finger and ankle entrapment from unlocked swinging sides is totally eradicated on these patented goalposts by locking the sides. Controlled by a key holder the goals are easy to move into position and anchor. The goal side frames fold neatly under the crossbar and lock away after use. When ready for use the side support frames are unlocked from under the crossbar and placed at ninety degrees into the open position and locked. Once locked the goals are safe and secure whilst being used. Likewise, after play the key holder releases the lock and the sides simply fit back under the crossbar. This patented system provides a safe alternative to all other types of hinged sided goals that rely on pins or spring mechanisms that may fail and allow the side frames to swing in and act like a guillotine. Each goal includes multi-surface anchors, recessed net fixings and a top quality braided knotted white net. Unlike other integral weighted football goals with lever wheel systems or rear rollers that cease up due to rubber or grit pitch infill our wheel system is steerable and does not entangle nets or cease up. A system designed for the English weather to transport free standing goals with the utmost ease on wet or muddy grass pitches without damaging or rutting the playing surface. Try one of these goals against any other free standing goal and you will see how much lighter, stronger and easier they are to use. 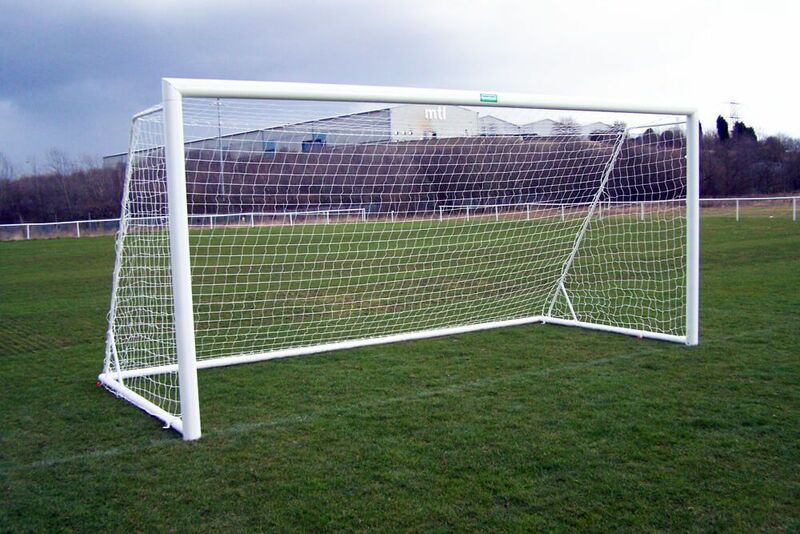 The price includes: a single goal, quality white net, folding goal side frames with recessed net fixings, ground back frame with rear ground fixings, multi surface goalpost anchors and all fixings required. Optional extras: wheel transporters, counter balance weights (see related products below). Please note the goalpost delivery time stated at the time of checkout is to deliver the goalpost using a standard courier. The larger goalposts are delivered by our own transport and times vary. We would contact you in advance to arrange a convenient date and time and the driver would be contactable to prevent unnecessary waiting. The video link below demonstrates our elliptical aluminium folding goalpost with the optional wheels. This is a larger full size goalpost however, it highlights how easy the goals are to move, fold flat and assemble on match days.